Well, not really. With Halloween (one of my favorite holidays) approaching, I thought it would be fitting to demonize sugar! The “average american” consumes something like 150 POUNDS of sugar per year. It’s no wonder our waistlines are expanding, diabetes rates are the highest ever (even in 9 year olds!! ), and cholesterol levels are rising. The pharmaceutical companies are having a field day with this. Used to be that fat was the bad guy. Have all those fat free products helped people lose weight? Guess not! Mostly because the fat has been replaced with SUGAR. Sugar has all kinds of destructive effects on your health. Sugar causes inflammation in the body, raises insulin levels, and contributes to cardiovascular disease and diabetes. Sugar fries your adrenal glands, raises cortisol levels, and leaves you fat and fatigued. Sugar contributes to high blood pressure. Sugar raises cholesterol levels. Sugar depresses your immune system and can contribute to cancer by accelerating tumor growth. That’s right, sugar feeds cancer cells. Sugar causes candida, an overgrowth of yeast and bad bacteria in the gut that contributes to yeast infections. Sugar has been linked to nearly every human health problem. Let’s say you wake up in the morning and grab a pastry and a coffee. After adding sugar to your coffee and consuming the sugar in your pastry, your blood sugar levels shoot up, and your pancreas releases insulin to usher all the sugar into your cells for use. Once all the sugar makes it into your cells, your blood sugar levels drop, and you crash. Maybe you get tired or moody or anxious, but you’ll definitely feel it. And even worse, you’ll crave more sugar. When you grab a snickers bar, the same reaction happens again in your body. But soon your cells decide they don’t need any more sugar, and so there it stays in your blood stream along with all that insulin. When the cells no longer use it, it’s stored as FAT. That’s right, sugar makes you fat. Even worse, now you have high blood sugar and insulin levels, and you’re on the way to diabetes or heart disease. Your cholesterol and triglycerides are probably high at this point too. SO. What to eat? Just avoid the processed, refined foods. Anything in a box. Stick to whole foods – meats, vegetables, fruits, legumes. Avoid soda, for god’s sake. Liquid calories. Stop adding sugar to tea and coffee. Beware of fat free foods! Read your labels!!! Sugar hides under all kinds of aliases. Brown rice syrup, evaporated cane juice, beet juice/sugar = sugar. High fructose corn syrup (the worst of all!!! ), sucrose, dextrose, fructose = sugar. Look for the sugar content on the label. 4 grams = 1 teaspoon. A soda has 10 teaspoons! Avoid artificial sweetners like Equal and Sweet & Low. They contain aspartame, which is a neurotoxin (read: causes problems in your central nervous system, kills brain cells, etc). Aspartame is usually present in those “Sugar Free!” products. Stevia is a good substitute for sugar. It’s super sweet and if you find it unrefined (it’ll be green as opposed to white), it can be used for baking. Agave nectar is pretty good too – it’s low on the glycemic index. Honey is an ok substitute, as it contains minerals and enzymes if it’s raw, but it still has the same effect on blood sugar to an extent. Increase other spices like cinnamon, cardamom, or vanilla, which add a natural sweetness. Read Ann Louise Gittleman’s book Get The Sugar Out. She outlines a whole plan to kick sugar. alright, alright. Here’s a sugar free recipe. Give this to the kids instead of snickers bars. Don’t turn up your nose at carob. It’s delicious, really, and doesn’t have added sugar like chocolate does. Grease cookie sheets and preheat oven to 350. Chop apples into small chunks and put in blender. Add almond butter, butter (or oil) and eggs. Puree. Can add a bit of water to make more of a puree. In a separate bowl, combine flour, baking soda, carob powder and salt. Mix well and add carob chips. Add puree to dry mix and stir just until well blended. Add optional sweetener if desired (stevia or agave). Drop by rounded spoonfuls onto cookie sheet. If desired, press almond onto top of each cookie. Bake for 10 min or so – don’t overbake. Yum! Thanks for sharing! 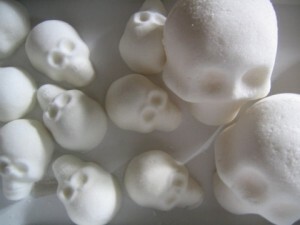 I love the sugar skulls. I’ll have to try the carob cookies….but I may alter the recipe and add pure cocoa instead of carob. Carob isn’t my favorite, but pure cocoa is, and I have been using it to perfect a lot of my own naturally-sweetened recipes. I also have used grain-sweetened chocolate chips in the past, and those are pretty good when you’re not eating ANY sugar! My new favorite, naturally sweet goodie to make is “Mounds”, using raw coconut oil. It is fantastic. Great post on sugar–I love it!